No matter where you walk, it's important to be safe and do everything possible to avoid being hit by a car. In Pennsylvania alone, nearly 151 pedestrians died in 2013 in pedestrian accidents. At Edgar Snyder & Associates, we have a variety of webpages on safety tips to prevent injuries and accidents, and to help keep you and your family safe. 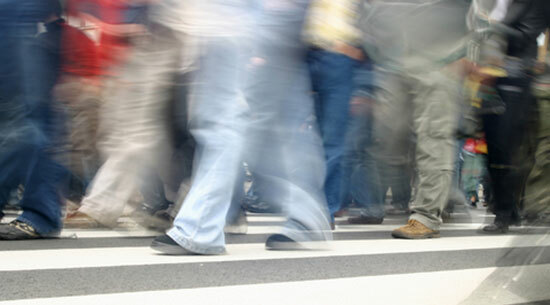 Check out these pedestrian safety tips. And remember, if you were injured in an accident, you can find out if you have a case with a no obligation, free legal consultation. Walk on the sidewalk when possible. If there's no sidewalk, walk facing traffic and in a single-file line. Don't trust drivers to stop, even when you have the right-of-way. Make eye contact with them so you can be sure they see you. Look both ways (left, right, and left again) before you cross the road. Always use a crosswalk when crossing the street. Don't ‘j' walk. If you walk across the street and not in crosswalks, vehicles have the right-of-way. Obey traffic signals, including ‘walk' and ‘don't walk' signs. Look across all lanes before you cross a multi-lane road. One driver may see you, but that doesn't mean others have. Watch for obstacles that might prevent drivers from seeing you. Don't cross the street from behind parked cars, trees, or other large objects. Stay alert when walking behind cars, especially in parking lots. Watch for reverse lights that indicate a driver wants to back up. Don't talk on a cell phone, wear headphones, or operate other electronics while walking. ‘Distracted walking' causes accidents every year, and chances are you will be more injured than the driver. When walking at dawn, dusk, or at night, wear bright clothing and reflective materials. Wear shoes, a vest, or belt with reflective strips. Avoid walking at night in areas that aren't well-lit. Don't cut through parking lots. Listen to crossing guards who monitor traffic outside of school zones. If you're waiting for a bus, stay away from the curb as much as possible. Don't walk in front of a bus unless the driver clearly motions for you to go. Remember to be cautious and to make sure other drivers see you as well. Hurting someone with your car is one of the worst scenarios you can imagine as a driver. Follow these safety tips to avoid injuring or killing someone. Follow all traffic laws, and yield to pedestrians when they have the right-of-way. Pedestrians have the right-of-way if they have a ‘walk' signal, and if they are in a crosswalk. Yield to pedestrians who are crossing the street and have a green light. Pennsylvania state law requires you to stop for pedestrians in crosswalks. You may see signs reminding you to stop or face fines. As you approach an intersection, check for pedestrians before proceeding. Stay off your phone, and don't text while driving. Statistics show that you're more likely to be distracted and hit a pedestrian if you're on your phone. Be especially alert when driving at dawn, dusk, and at night. Your visibility is lower than during the daytime, so you may not see a person step onto the road. Listen to the 15-minute speed limit in school zones. If you're caught speeding in a school zone, you could be penalized with points on your license and hefty fines. Always stop for school buses that are loading or unloading students – it's the law. Look for pedestrians walking between parked cars or behind large objects, such as an overgrown tree. Follow all school safety laws. As a courtesy, motion for pedestrians to go when they make eye contact with you. It eliminates confusion. Hit by a Car? Hurt in a Pedestrian Accident? If you were hit by a car and hurt as a pedestrian, you may have serious injuries to deal with. You might have piles of bills and wonder how you're going to make ends meet. When you have questions, contact Edgar Snyder & Associates for answers. Call 1-866-943-3427, or fill out the form at the top right of this webpage for a no obligation, free legal consultation. Or, you can use our easy and convenient "click to call" and "click to chat" services online. There are time limits to file a claim, and evidence disappears quickly. Contact us now to protect your legal rights.